Rock Drill Sales has over fifteen years of experience providing our customers with replacement parts and service kits for their Epiroc / Atlas Copco equipment. Whether your machine is broken and needs repair or you are looking to replace a part to ensure the integrity and upkeep of your machines, Rock Drill Sales can help. Need Help? Call the RDS "Parts Hotline"
At Rock Drill Sales, we have experienced staff members available that can answer your questions about replacement and repair parts for all types of Epiroc / Atlas Copco equipment! Our "parts hotline" is available to anyone Monday - Friday from 8:30 am to 5:00 pm EST. Please have your equipment's model number or a specific part number ready prior to calling. Common replacement parts that we supply to our customers include: rotary heads / power heads, airends, lubricant / ParOil, hydraulic motors / pumps, seals / gaskets, filters, and service kits. 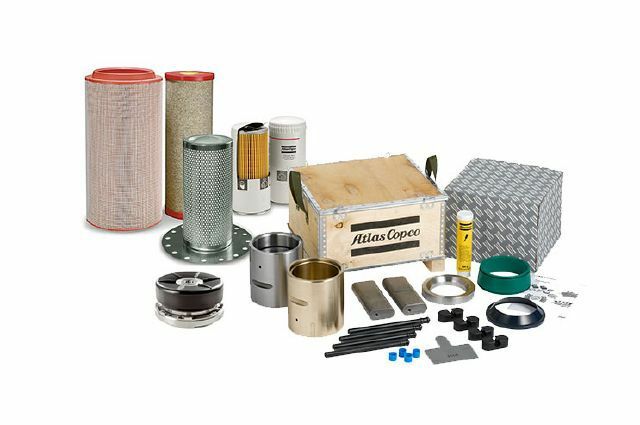 The best way to maintain your Atlas Copco equipment and to prevent costly breakdowns is to always follow the manufacturer's recommended service schedule. Rock Drill Sales has service kits for all types of Atlas Copco machinery and for varying "hours" benchmarks (ex: 250 hour, 500 hour, 1000 hour, etc). Contact our team today for more information, your free quote or any questions you may have. We look forward to hearing from you!